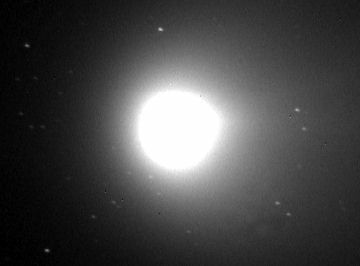 These are CCD images and conventional film photographs that I have taken of various comets. Be sure your browser's window is nice and wide; otherwise this page will be a little messy. Click here for the story of Comet C/2012 C2 (Bruenjes) that I discovered. On July 3rd, 2005, NASA's Deep Impact spacecraft impacted Comet 9P / Tempel 1. This caused a brightening of the comet as seen in my images below. 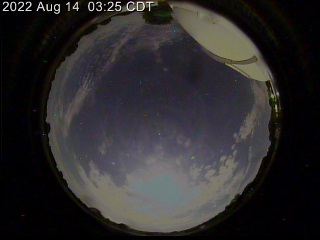 For a Quicktime time lapse movie (688kb) showing the brightening, click here. This movie covers one hour and forty minutes, using nearly a hundred individual one minute exposures. The comet moves from upper right to lower left, with a sudden increase in brightness that was caused by the spacecraft impact! 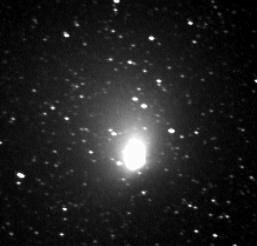 This is about a one-minute exposure of Comet Hyakutake (C/1996 B2) that I took on Tuesday, March 26, 1996. The camera was simply mounted on a tripod and pointed at the comet. This particular photo was taken with a telephoto lens. Other than scanning into a computer and tweaking the contrast, no processing has been done on this image. The long, thin, bluish tail is the gas tail, and the shorter, wider, reddish one near the head of the comet is the dust tail. 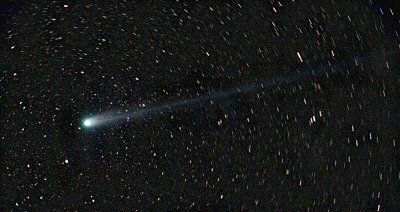 The is also Comet Hyakutake (C/1996 B2), but a wide angle view. The bright star to the lower left of the coma (the head of the comet) is Polaris (the North Star). The Big Dipper is just out of view to the upper right. This view has been highly processed to bring out the faint tail, and therefore there are some dark blotches near the comet. 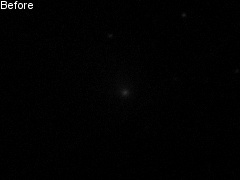 This is my only CCD image of Comet Hyakutake. 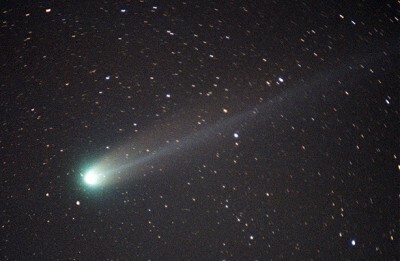 It was taken on March 15, 1996 when the comet was not yet at full brightness. The tail really does not show well because my camera is much more sensitive to the red part of the spectrum than the blue. Since the coma is a very bright white and the tail is a faint blue, the tail barely shows. This is a four minute exposure, dark framed and flat fielded. Comet Hale-Bopp (C/1995 O1): This image was taken in July 1996, when the comet was still pretty far out. 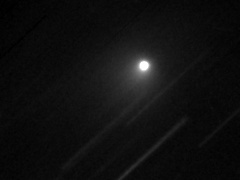 Suprisingly I was never able to get a good image or photograph of the comet when it was closest to Earth. The thing was simply too big and too bright! Why don't you head on to my Other Cool Stuff page now?